This 4 minute program is an introduction to understanding our own and responding to others verbal and non-verbal signals, using Compassion, Unity, Empathy, and Sharing. A short but comprehensive and powerful tool, DOING OUR PART teaches us about communication, teamwork, problem-solving, and productivity. 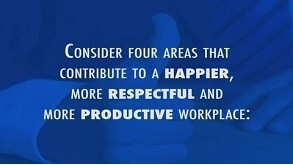 This unique and visually arresting program emphasizes the personal responsibility we all share for creating a unified and respectful workplace.